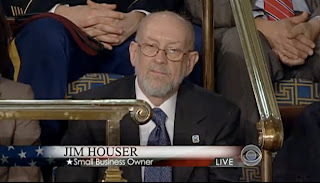 On January 25 I had the honor of attending the 2011 State of the Union Address as a guest of President and First Lady Obama. The previous week I had taken a call from the White House at my business, Hawthorne Auto Clinic that I co-own with my wife Liz Dally, asking me to join the First Lady in her box overlooking the U. S. House of Representative’s chamber in the Capitol. Military heroes, victims of the attempted assassination tragedy in Tucson, representatives of business, education and our government were among the 20 invited guests. On the evening of the Address, guests and family members (my daughter, Helen Dally, was able to join me) arrived at the gates of the White House. 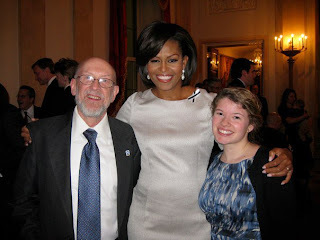 After a brief transit through security we were assigned a staff member who led us to our reception in the first floor Entrance Hall where we were graciously welcomed by Ms. Obama. At 8pm, while family members (accompanied by Bo, the Obama family dog) remained behind to watch the Address on TV from the Blue Room, the invited guests were escorted to waiting vans and were sped, with lights and sirens, to the Capitol. The First Lady’s joined us after arriving with the President. We watched from our box as members of Congress entered, followed by several members of the Supreme Court, the Joint Chiefs of Staff, the President’s cabinet, and finally, the President. The President’s speech did not disappoint. He laid out a plan for focused investments in education and infrastructure, emphasizing America’s competitive advantage in, among other areas, green technologies. He challenged Americans to put aside partisan differences and he directed our government to achieve savings by freezing most spending and improving efficiencies. But it was President Obama’s emphasis on his health care reform accomplishment, The Patient Protection and Affordable Care Act (PPACA) that most captured my attention. The reality is that most Americans under 65 rely on their employers for health care coverage and most Americans work for small businesses. Employee benefits, like health care, are important when competing for the best employees. Small businesses don’t have the clout to negotiate for lower health insurance premium prices the way large employers can. Over the last decade, health care costs have become a crushing weight for small businesses and many have dropped coverage all together. My company provides health care coverage for our 9 full-time employees and their families. Our premiums have doubled over the last 8 years to now equal $90,000, over 20% of payroll. The PPACA is already providing major health insurance premium relief to many of the 4 million eligible small businesses all across the country. According to our accountant we will be receiving a 2010 tax credit over $5,000 to help us pay our increased premiums. And there are even greater health care reforms slated to take effect in 2014. As we returned to the White House following the Address I was struck by how truly unique our democracy is. Those of us joining Ms. Obama were not famous celebrities or major campaign contributors. In nearly every way we were a representative cross section of our citizenry. My fellow invitees and I participated in a Constitutionally mandated official duty of our President. The invitation to attend the State of the Union Address as a guest of our First Lady was a great honor.